Your vehicles alignment can be knocked off from normal wear and tear on the road. If you’ve accumulated a lot of miles, chances are that your tires are misaligned. The most obvious sign of an off wheel alignment is veering to the left or right when you’re attempting to drive straight. Drivers should get this straightened out, literally, as soon as they can. 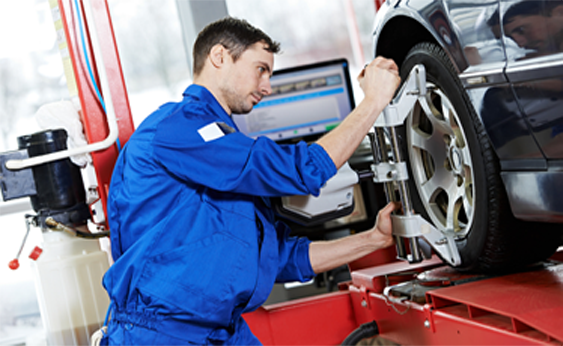 CarMotive mechanics in Houston are highly skilled and trained in performing precise alignment service. We use the most advanced tools and equipment so you always know that you’re receiving the best quality service possible. While some drivers may get accustomed to driving with an off alignment, they are actually allowing a dangerous driving condition. You should keep yourself and your passenger’s safe with our exact wheel alignment. Our mechanics will perform a complete diagnosis of your vehicle’s alignment and communicate to you all of our findings. We’re able to recognize and fix any other problem with your steering system that could be the cause of your vehicles pulling. Our alignment service will save you money by preserving your tires. An off wheel alignment will cause your vehicle’s tire tread to wear unevenly, which can also be very dangerous if left unattended. This ultimately forces you to replace your tires before you can get the full use out of it. Tires are supposed to grip the road and create traction, but misalignment will compromise tire performance. Receiving our alignment service in Houston, TX will make you and your passengers safer on the road, and will prevent wasting money from early tire replacement. Maintaining your tire tread also helps prevent any potential tire blow outs. Wheel alignment is a maintenance that should not be overlooked. If you suspect that your vehicle’s alignment is off, then it probably is off and at that point your safety and your savings should be your priority, we know it’s ours. Misalignment will cause you to lose on both counts. Bring your vehicle to us first for alignment service, and we’ll restore them.